Dimensions: 11 1/4" x 12 1/4"
The back-lit geometric stained glass mural in the foyer of the Arizona Biltmore, titled Saguaro Forms and Cactus Flowers, was designed by Frank Lloyd Wright. In 1926-27, Mr. Wright was commissioned by Liberty magazine to create a series of cover designs, one for each month of the year. His imaginative graphic designs were rejected: deemed too 'radical' by the publisher. Saguaro Forms and Cactus Flowers first appeared on the cover of an anthology of lectures Wright gave at Princeton in 1930 entitled Modern Architecture. In 1973, the Arizona Biltmore experienced a devastating fire. 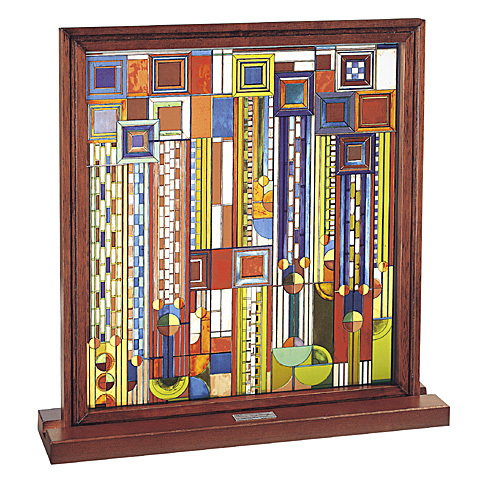 During the reconstruction, the graphic design was selected from the Frank Lloyd Wright Archives to be rendered in glass and produced in the colorful and decorative symmetry seen here.